July 26, 2018, 3:30 p.m.
About two years ago, Samsung, the South Korean electronics giant, had a problem. Batteries in its Galaxy Note 7 smartphone were generating excessive heat, causing some devices to catch fire and explode. Consumer perception of the brand cooled. 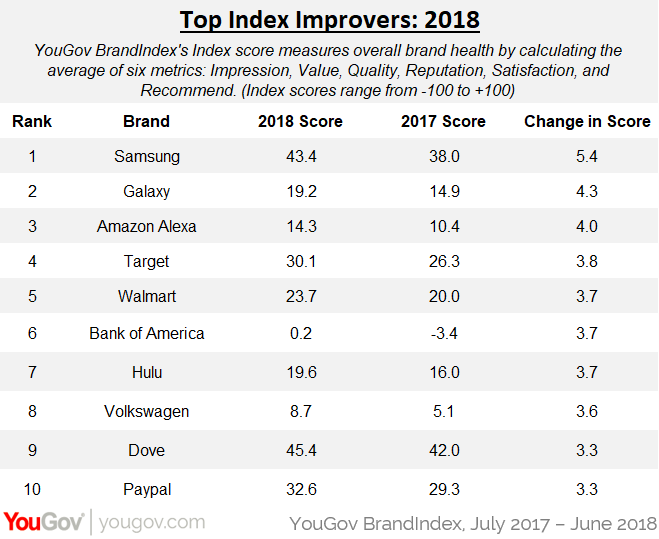 Now, however, fresh figures from YouGov BrandIndex reveal that out of over 1,600 brands across multiple sectors, Samsung has experienced the largest improvement in brand health throughout the past year. An annual review of Samsung’s Index score, which measures overall brand health by calculating the average of six metrics – Impression, Value, Quality, Reputation, Satisfaction, and Recommend – shows that the brand increased 5.4 points, from 38 in 2017 to 43.4 today. The Samsung Galaxy itself also appears near the top of the improvers list, having climbed 4.3 points, from 14.9 to 19.2. Indeed, this year’s collection of brands with the biggest gains in overall health contains a handful in the midst of recovery. Volkswagen&apos;s Index score, for instance, has jumped from 5.1 to 8.7 after the automaker got caught cheating on diesel-emissions tests back in 2015. Likewise, Bank of America has been inching upward ever since the 2008 financial crisis dragged its score into negative territory. 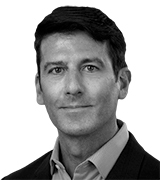 Other brands are relatively new with plenty of potential for growth. Paypal, for example, which saw its Index score rise from 29.3 to 32.6 is helping provide a glimpse into a world without cash. Meanwhile, Amazon&apos;s Alexa is a leader in the emerging market for virtual assistants, and Hulu has continued to build momentum with its critically acclaimed original series The Handmaid’s Tale.